The Italian Futurists, a century ago, exalted modernity, speed and war. America has succumbed to that unholy trinity, as our hyper-aggressive culture demonstrates. The Oakland artist/blacksmith John Colle Rogers, a member of Survival Research Laboratories, uses his ironmonger's skills to indict and mock New Sparta in Pure War, at Pro Arts. Someone described America's basic metaphor as a projectile hurtling through space. 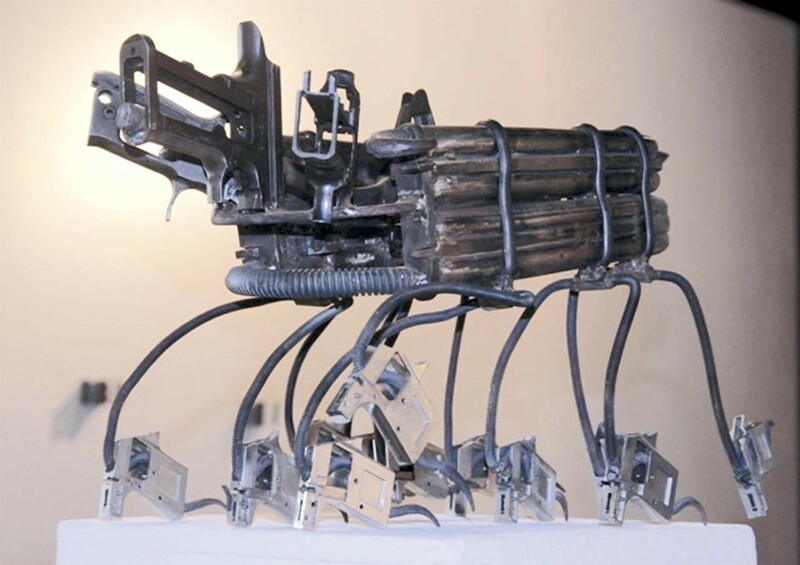 Rogers takes aim at our macho fascinations with guns and cars - which he shares, but not at toxic levels - through sculpture and video. His Strategic Critter Assembly is a sinister and comical conclave of bat-winged, antennaed creatures fabricated from gun parts, dancing or promenading atop a hexagonal gameboard. Shot Boxes/Shot Plates is a series of metal cubes and squares perforated by pistols and assault rifles: minimalism for bulletheads. Gunnasaurus and The Wahoo are mythic animals, gone ballistic. Snowflake, is a hexagon of barbed fleur-de-lis points, a floral caltrops.